Samphires and Glassworts are a confusing lot. ‘Glasswort’ is a generic term for plants in both the Salicornia and Sarcocornia genera. For our purposes though, they can be treated the same way…tasty! Interestingly, they’re related to Amaranth. The name ‘Glasswort’ comes from the fact that, in the old days, the plants were burnt to provide the ash that was used in the manufacture of glass. The ‘wort’ is the Saxon word for plant. 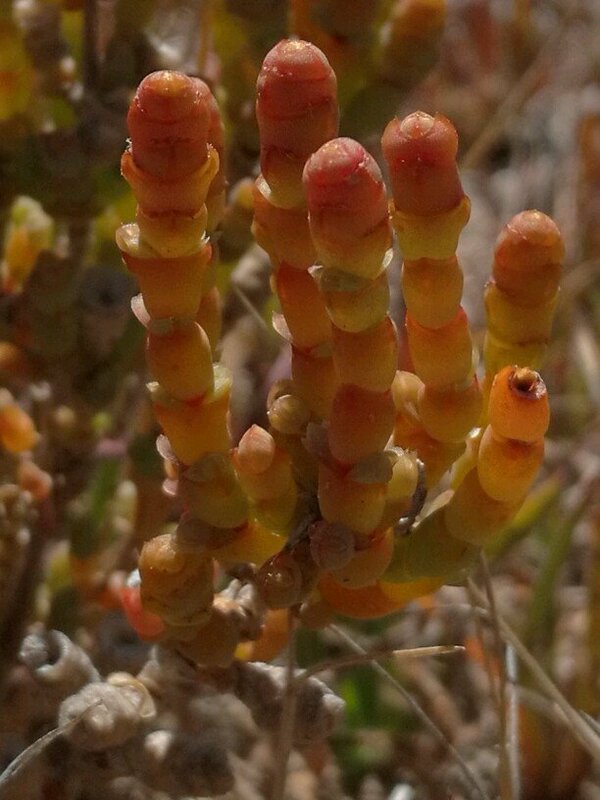 These little, alien looking plants love the salt flats and swamps near the coast. Each of the segments is quite tasty with a salty taste and crunchy texture. My favourite way to eat them is chilled in a salad. Some steam or microwave them, but I find half the pleasure is in the crunchiness! You can lacto-ferment them too and there’s no need to add salt, there’s enough in the plant. These plants are an excellent source of B-complex vitamins, Vitamins C and A, calcium, iodine and iron. You can even buy it as a nutritional supplement. With our local species you don’t have to get too hung up with identification. Your taste buds will let you know which ones are edible and it seems to be location that is the main determinant of taste, not the species. As I learn to identify them more accurately, I’ll post updates on this page.